[PDF] French Vocabulary Drills | Free eBooks Download - EBOOKEE! Description: Practice your way to a bigger vocabulary and better French skills If you want to expand your language skills, French Vocabulary Drills is filled with the information and practice you need to reach optimum results. 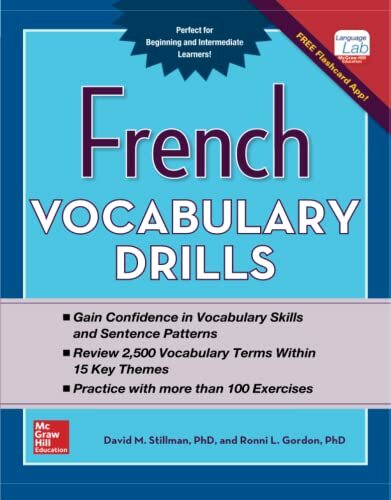 Written by bestselling language-teaching experts David M. Stillman and Ronni L. Gordon, this book features essential French words grouped together into similar themes such as daily life, food, house and home, travel, holidays, technology, arts, and the economy, helping you to grasp meanings and remember terms more easily. The unique presentation of vocabulary in context bridges the gap between words and conversation. You can practice your new vocabulary with more than 100 written exercises, including fill-in-the-blank, matching, translation, and composition. And French Vocabulary Drills gives you access to an exclusive flashcard app for use on your smartphone, giving you a convenient, on-the-go tool for further language-learning reinforcement. Learn more than 2,500 essential terms Practice your vocabulary skills with more than 100 exercises Check your progress with a helpful answer key Study on-the-go with a free companion flashcard app Best of all, gain the confidence to communicate in French! No comments for "[PDF] French Vocabulary Drills".